Public cloud allows the accessibility of systems and services easily to general public. Eg: Amazon, IBM, Microsoft, Google, Rackspace etc. Public cloud is having low cost as compared to private or hybrid cloud, because it shares same resources with large number of consumer. 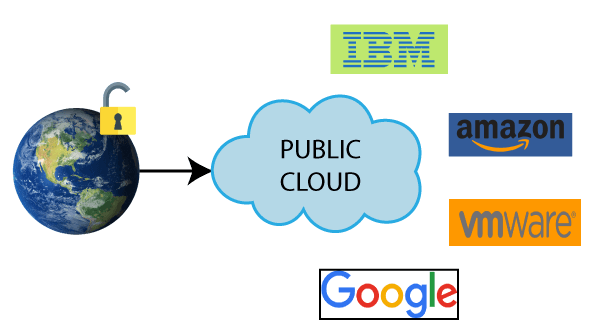 Public cloud provides large number of resources from different locations, if any of the resource fail, public cloud can employ another one. It is very easy to integrate public cloud with private cloud and hence it gives flexible approach to consumers. It ensures the independency of location, because public cloud services are delivered through Internet. Cloud resources are available as per the demand from the pool of resources that means they can be scaled up or down according to the requirement. In public cloud model, data is present off-site and resources are shared publicly. Hence it does not ensure the high level security. It is less customizable than private cloud.